The Spread Matrix also displays Butterflies and Condors. A Butterfly is a trading strategy that involves three outrights. A Condor is a trading strategy that involves four outrights. Most of the procedures and features for the Butterfly/Condor Matrix are the same as the Spread Matrix. Buy (or Sell) of one contract in an even later month. The combined price of the two contracts being sold (bought) subtracts from the combined price of the two contracts being bought (sold). Note: Implied data does not display for Condor Matrices because NYSE Liffe does not match implieds from Condor Matrices. 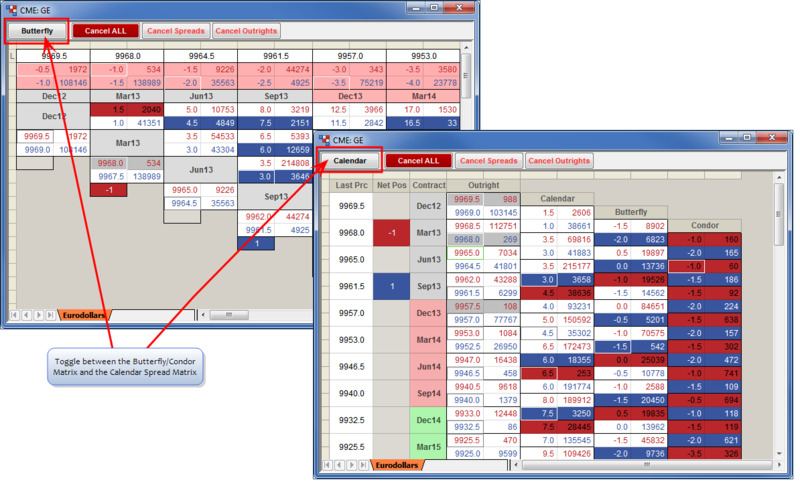 You generate a Butterfly/Condor Matrix using an existing Spread Matrix. At the top of the Spread Matrix click the Butterfly button. Add a tab to the Spread Matrix. Generate a Spread Matrix in the new tab.